Rory McIlroy traded spotting lions and elephants for looking at leaderboards in snatching seven birdies on day two of the DP World Tour Championship in Dubai. 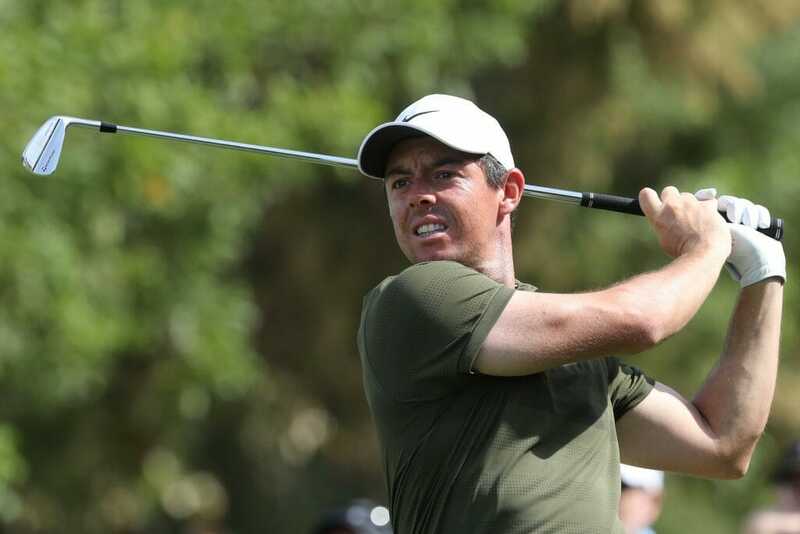 McIlroy produced his lowest score of a five-under par 67 since last month’s Tour Championship to be trailing just three shots behind England’s Matthew Wallace. Bizarrely, Wallace had been fined Euro 3,400 a day earlier for slow play but made a mockery of his ‘tortoise’ ways in sprinting to the top of the Jumeriah Estates board with an seven birdie haul in his 65 for an 11-under par tally. Past Masters winner, Danny Willett (67) along with his England compatriot, Jordan Smith (68) and Spaniard Adrian Otego (68) share second at 10-under par. Reigning Masters champion, Patrick Reed and who played alongside McIlroy, posted a 66 to be in fifth spot on nine-under and with McIlroy and Ryder Cup team-mate, Tommy Fleetwood (67) plus two others a shot further back. McIlroy arrived in Dubai having not broken 70 in nine straight rounds since his 64 on day three of the Tour Championship in Atlanta. This included four rounds in 70s in Shanghai and then another four last week at Sun City in South Africa. Ironically, and now in his final event of the year, McIlroy’s name appears high on a leader-board as he also seeks not only a second victory this year but a third DP World Championship trophy. “It’s been a big improvement, considering how I played in China, especially, and then it was a little bit better last week at Sun City but it’s been a big improvement again,” he said. “I’m getting the driver in my hands and feeling confident, that sort of feeds all the way through the rest of my bag. “So, it’s good to be again to see my name on leader-boards as I have been nowhere near them. “I was more trying to look for wildlife last week in South Africa and trying more to look for lions and elephants than leader-boards (smiling). The McIlroy/Reed match easily attracted the most interest on day two of the final event of the year and with McIlroy managing early bragging rights by birdiing the first. They both birdied the second only for McIlroy to drop a shot at three. The pair headed to the turn each at three-under for the round and with Reed going ahead with birdies at 10 and 11 and from thereon in, it was the American who walked off with a 66 to McIlroy’s 67. “Patrick certainly brings out the best out of him,” said McIlroy. “But yeah, it’s fun. Patrick and I get along great. “There’s a respect between each other and the way we play the game. I thought the way he gutted it out at the Masters this year to get in, that was fantastic. Paul Dunne gained from a pre-round tip by coach, Justin Parsons and went out and turned around a first day 72 with a second round 69 for a brighter-looking three-under par tally. “I don’t normally ask for a second opinion but I just wanted to have something in my head teeing-up today so I asked Justin to have a look at me,” said Dunne. “Other people have a way of phrasing things differently so, it was a fresh perspective. Someone says the same thing slightly differently and it just clicks in your head. “I was going out just thinking even if I hit three shots that are exactly as I pictured, it is something to go with because I didn’t hit any of them yesterday. And Shane Lowry will be hoping for a very low third round to ensure himself a late Sunday tee-time given he’ll be up to the early hours of Sunday morning (UAE) time watching TV coverage of Ireland hopefully lowering the All Black colours. Lowry posted a day two 72 to drop back to a share of 33rd at two-under par.